“If you look closely across the bow you can see we are about to be surrounded by them” said Captain Moncure as he guided the River Steward boat across an oyster reef in Carter’s Creek. 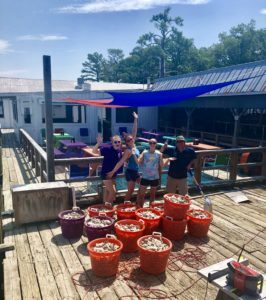 My friends and I had signed up to spend a day with Friends of the Rappahannock (FOR) shoveling recycled oyster shells into orange and purple bushel baskets and then hauling them onto the skiff and out onto an oyster restoration project. After a hard days work, little did we know that we would be escorted back to docks by a curious pod of dolphins! 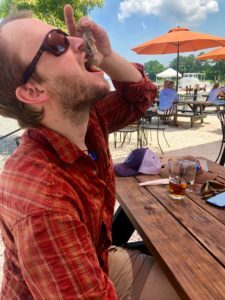 Over the course of the day I was surprised to learn so much about oysters, the history of the Rappahannock River, and all the work Friends of the Rappahannock was doing with oysters. For instance – I had no idea one oyster could filter a whole 50 gallons of water EACH DAY! Or that back when John Smith first got here, we had so many oysters that they could filter the entire volume of the Chesapeake Bay in ONE DAY!! This trip was awesome and it should really be called a river boat cruise. 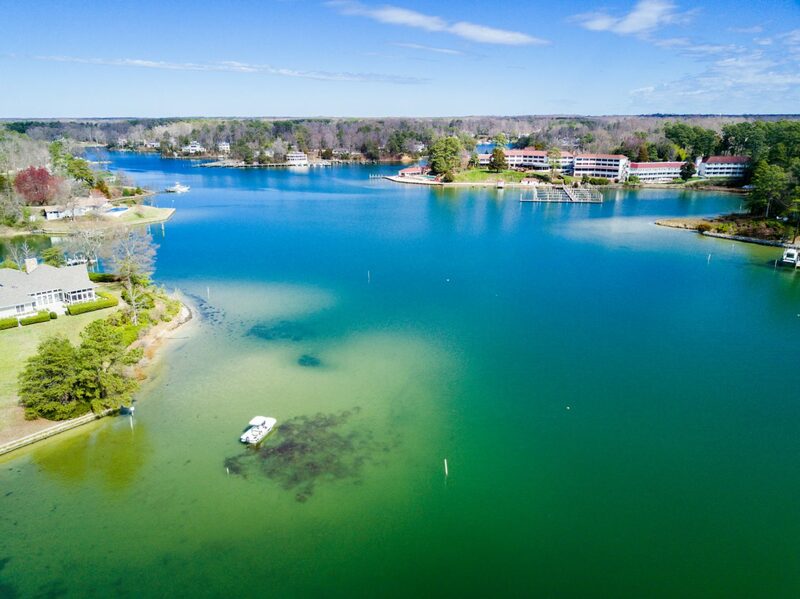 We met in Urbanna, Virginia at the base camp for Shores and Ruark Seafood Company on Robinson Creek at a restaurant and working waterfront called Urbanna Seafood Market & Raw Bar. FOR partners with Shores and Ruark and a group called, “Restore Urbanna Creek Partnership” to restore oyster reefs in neighboring Urbanna Creek. This is where we loaded up our oyster shell before we headed out to the water. On our ride over, Captain Moncure pointed out osprey nests, regaled us with the history of the deadrise boats, and that wharf over there, and really got our attention when he listed off all the schools they work with in the region. “We are lucky to partner with students from Christ Church School and the Chesapeake Bay Governor’s School on several of these oyster projects” Moncure said. He said the reef we were working on that day had already had close to three million oysters planted on it by Restore Urbanna Creek partners and we were adding shell to expand the restoration footprint. 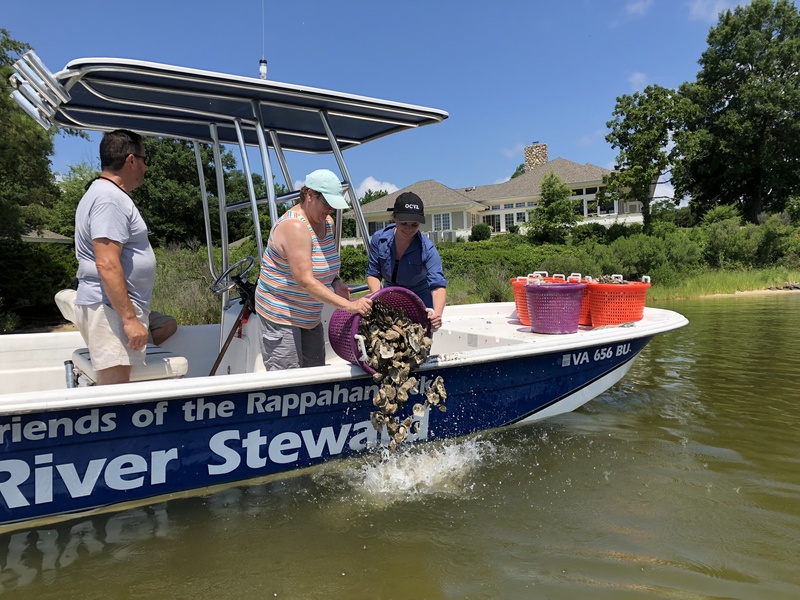 We dumped about 12 bushels of shell onto the Urbanna Creek reef and then headed out across the main stem of the Rappahannock on our way to Carter’s Creek. Carter’s Creek was breathtaking. While idling towards our destination the water on all sides was shimmering as the sunlight cascaded off the wake of our boat. As we ventured further into Carter’s Cove we received a cautionary history lesson of the rise and fall of the booming Rappahannock seafood industry as it struggled with diseases impacting the oyster populations across the Chesapeake Bay. Just as we were pulling up next to the largest boat around, Captain Moncure reassured us that modern science and restoration efforts by groups like FOR were slowly getting the industry back on track. He introduced us to the “Ellery Kellum”, the flagship vessel of W.E. Kellum Seafood who currently is one of the largest producers on the east coast! We got out to tour the working waterfront and then came upon what I thought could be nothing short of the largest pile of oyster shell in the world! (I learned later that is was rather small compared to historic shucking house oyster shell piles). We were directed to once again shovel shell into our brightly colored baskets and then loaded them back onto the boat. We had another reef to go restore! This reef was actually donated to FOR by Kellum Seafood and has had a bunch of work done on it with several groups including the VCU Rice River’s Center through their oyster shell recycling program. It took us no time at all to locate the restored “oyster rock” as the waterman call it, and then we were able to micro target where we dumped our bushels of shell. This is when the dolphins surrounded us and decided it was time for us to have lunch back across the river on the patio of Merroir’s oyster tasting room. Needless to say there were no arguments from us. It was so great to see and learn about all of the oyster restoration work happening in the Rappahannock River and getting to participate and contribute to an ongoing project and spend the day in such a beautiful place. I even learned I can help the effort by eating at a couple local restaurants that recycle all their oyster shell! As we were packing up for the day I was pleased to hear Captain Moncure say that FOR is planning three times as much work on the oyster reefs in 2019 and that there will be even more volunteer opportunities to get on the water. Be on the lookout for these projects next year! This event series is made possible through generous donations from local partners including: Virginia American Water, Dominion Foundation, W.E. Kellum Seafood, Shores and Ruark Seafood, and the Chesapeake Bay Restoration Fund.